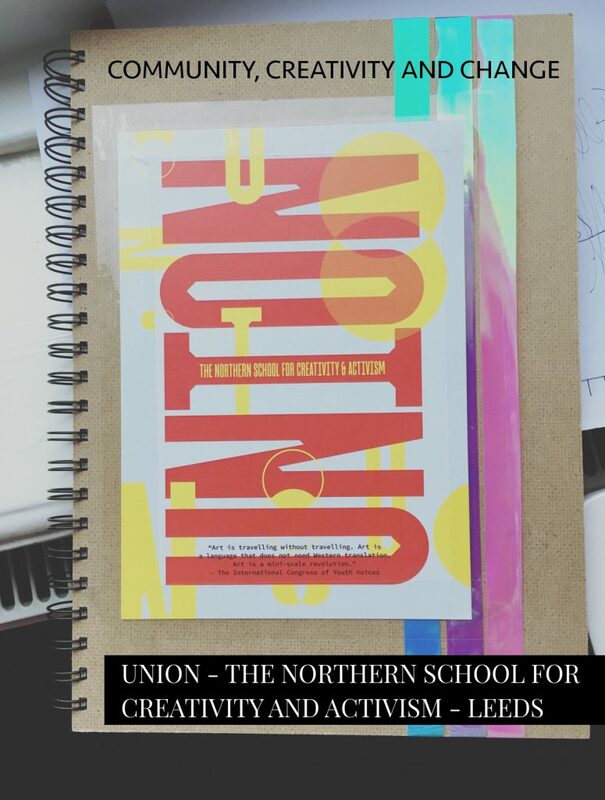 Over the weekend of 11-12th January 2019, 20 creatives, artists and activists from the North of England met at a converted chapel for the commencement of UNION – The Northern School of Creativity and Activism. UNION is a sector-based coaching programme for emerging community artists and social activists across the North of England. The aim of the course is to help emerging artists and activists develop their practice over 5 residential weekends in community-based initiatives throughout the North and via coaching. The course is the brainchild of Adrian Sinclair, co-director of Heads Together and Chapel FM – an arts centre based in East Leeds. Community, Creativity and Change was the theme for the first weekend based at Chapel FM in the Seacroft area of East Leeds and even now, a few weeks later, I’m still processing the amount of information, connections and perspectives absorbed. You know when you meet a group of like-minded people, people who are all creatives, people who are actively trying to make the world a better place – ‘do-ers’ as Lauren Sanders observed from the weekend – that is what took place. One of the things that struck me most about walking into ChapelFM on that wintery Friday evening was the welcoming nature of the place. The entrance is open, light, and airy. The staff and course facilitators friendly and doing the best to put us newcomers at ease. A welcoming dinner eaten in the Methodist church hall, served by kids from the cookery club, rooted the essence of the weekend to come and what the course is about – community. While there was an element of group work at the beginning of the day, Saturday was all about community engagement in the Seacroft area of East Leeds and what that takes in an area which is traditionally viewed on most indexes as a deprived area. Those of us who are averse to the cold and have mobility issue drove to meet, Samantha Abbott who runs the PlayBox in the Park in Rein Park for children in the area. The PlayBox is a converted shipping container which is used as a focal point for local children to be able to do arts, crafts and sporting activities. LS14 Small Change cafe, run by the LS14 Trust, was particularly inspiring. Howard’s talk on the models of long-term community engagement builds trust in an area and community, especially places with long-term poverty, was thought-provoking at questioning my own motives as a practitioner. The stand out quote from his talk to our eager participant ears, was how do you change the perspective from focusing on what’s wrong with a place or community to what’s strong about an area and its people? Balancing the tensions of a paternalistic society that focuses on fixing a perceived wrong, along with the need to satisfy funders while engaging with jaded communities that have seen too many projects or initiatives come and go. It certainly made me question the current models established in the Dwarf community and challenged my own intentions for how I would like to engage with our community moving forward. The two main themes that arose and left me with more questions than answers. Firstly, it was the realisation and seeing in practice that the building of a community and the building of trust within a community is a long-term commitment and investment. It’s not a 6-week thing or even 6-month project. It’s about creating something that embeds into a community, builds trusts and most arguably, empowers those within it. That it is vitally important to question the motives of any organisation who wishes to engage with a particular community and why. Who do the initiatives that are set up to resolve perceived deprivation or lack in a community, actually benefit? To question who really benefits from a project in the long-run – financially, professionally or to satisfy a funding tick-box, in the long-term? Is it not often the case that community groups are left jaded or with cynicism, by the fleeting nature of those who come in to ‘fix’ a perceived lack or wrongness rather than asking what a community wants help or support with, or seeing communities as equals to be included in the decision-making process in an area. Secondly, from my own personal and professional perspective, I feel I came away with the language and toolkit to frame my work. And to start using that with confidence. To be able to call myself a practitioner and know that while my practice (over many types of media) may not be easily defined as a particular specialism, it’s a role and a worthy one nonetheless. I’ve long struggled with calling myself an artist or adding a title to the work I do. The isolation with that diminished that weekend. I could finally put my aims, my ambitions, my work into context and acknowledge that for myself. As a self-professed Scanner, I could have jumped for joy when in a presentation I saw the title ‘Multipotentialite’ – another term for a person who identifies as a Scanner. I finally felt I’d found a professional hub that I could place my varied skill set and my ambitions into a framework that will develop me as a practitioner and my practice further. Where did the weekend leave me? It was in this thought-provoking and safe environment that I enabled me to face my own motives and the work I wish to undertake as a practitioner. Questioning how do I really want to engage with the Dwarf community. I’ve dithered for far too long about the direction to go in with Hello Little Lady and what’s best the route to take when working on a creative project. When really it’s procrastination and fear of getting started, wanting to do right by a community and my own fears. To not know all the answers straight away or too many expectations of how you want projects to develop. To actually have fun with this work! It’s a quote like that, that gives you permission to begin. And that is the essence of what UNION is about. It’s taken 20 creatives and helped us to begin to make an impact on own communities.